Ontario pot shops up in the air. 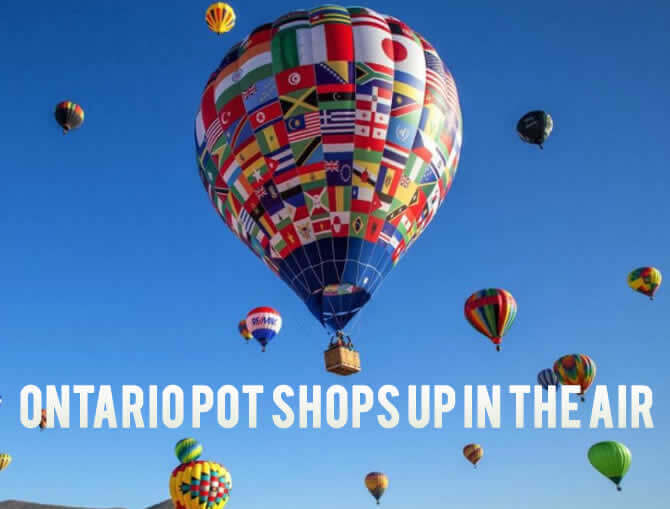 With under three months before cannabis becomes legal, Ontario has announced few retail stores. Ontario intends to control all cannabis sales once it becomes legal, but its pot shops are up in the air. Currently there are more questions than answers about its brick and mortar stores. Canada is set to legalise recreational pot on October 17. Ontario was the first province to announce a detailed plan for the government to open 40 stores in 2018. Under the umbrella of the Liquor Control Board of Ontario (LCBO), it set up a new agency called the Ontario Cannabis Store (OCS). So far it has only announced four store locations. These are in Guelph, Kingston, Thunder Bay and Toronto. Despite this, the OCS website FAQ page maintains it will still meet this target this year. Appointed president of OCS, Nancy Kennedy was to lead the changes but received a promotion. Her promotion to deputy minister of the Treasury Board Secretariat leaves unanswered questions. OCS currently has an acting president, David Phillips, a former Alcohol and Gaming Commission official. His new role was not announced publicly. This all seems to leave the opening of 40 cannabis retail stores in 2018 in doubt. With few answers forthcoming from the LCBO, Ontario’s retail plan is falling behind schedule. Vancouver PI Financial analyst Jason Zandberg said state run retail stores were not an ideal solution. He said the best outcome was for private retailers to open pot shops to sell to the public. At the current rate, Ontario would have the lowest cannabis sales in Canada. A government finance ministry spokesperson said the government was still working towards a cannabis sales and distribution system to meet the new laws that come into effect on October 17. The government’s goal is to have a system in place to end the black market and to protect Ontario’s youth. But, other sources report that signing leases for cannabis stores seem to be on hold with a new government in the province. Executives in the private sector hope the delays may signal the government’s intention to move sales to the private sector. Global Public Affairs senior vice president and founder of cannabisCONNECT Rod Elliot said the government may be reviewing previous government financial initiatives. It appears the rollout of the OCS is waiting for direction from the new Ford government. During election mode, Doug Ford, Ontario’s new premier hinted he was open to moving to a private model. A move that would allow hundreds of cannabis stores to open by private retailers. But there is still no word. Experts have advised the new government to consider allowing private retailers into the market. They can open cannabis stores with more efficiency which would allow the state can compete with the black market. Currently it looks like the biggest sales in Ontario will be online. There should soon be announcements about supply from licensed producers. But it is still unsure where the public will be able to buy their cannabis supplies. Ontario’s government intends to keep control of cannabis sales once it becomes legal. It intends to use Shopify’s software to process online sales and in its stores. OCS will use the platform to manage sales and inventory, as well as the accounting for its stores. While the Ontario controls recreational cannabis sales, other provinces take a different approach. British Columbia and Alberta has no restriction on the number of private stores. And, Saskatchewan plans to open more than 60 stores in 2018. Last year Ontario passed new laws that gave the province total control of cannabis sales. These laws also gave its finance minister the power to make exceptions. Kington location there is only an empty store with a for lease sign at the address. Guelph location is has become a fenced work site since late June. Toronto location attracted concern as it is within 400 metres of an elementary school. No one under the age of 19 will be able to enter and there will be someone manning the door to check IDs. (Montreal law allows pot shops within 150 metres of a school and in Quebec it is 250 metres.) All was quiet here until there were building permits granted in mid-July. Now construction workers are renovating the store. Thunder Bay location there is no reports of work going ahead to get it ready to open in October. There is more progress in other provinces to prepare for Canada’s new cannabis legislation. In Nova Scotia, its Liquor Corporation will sell hundreds of cannabis products from its liquor shops. They are currently outfitting these and are on track to be ready when Canada’s cannabis laws change. New Brunswick will be ready to open 20 state run pot shops on October 17. And in Labrador and New Foundland there is a list of 29 pot shops run by the private retailers. Everyone is gearing up in preparation to supply recreational when Canada changes its cannabis laws in October.